I’ve written a lot about the modern day need to be connected 24/7. To have the Internet in all its various forms – email, social networks, search, breaking news, etc. – at the mercy of our fingertips. It’s no secret – we are creatures of instant gratification. Hear a ping, open your email. Forget the name of that actor in a movie, open the IMDB app on your cell phone. Need directions, speak to Siri. Google it. Shazam it. Tweet it. And so on. Conveniently enough, the mobility of cell phones, iPads and laptops allow for our uninterrupted state of connectedness. Miraculous as this is, there are flaws in each of these technologies that prevent us from doing literally anything, literally anywhere. Although laptops have significantly decreased in size and weight in the recent past, they are still a bulky, space-consuming hassle. Not the most convenient for the on-the-go lifestyle many of us lead. Smart phones have become pretty much as conveniently mobile as we can imagine (although I’m sure there’s something in the technology pipeline of the future that will somehow make mobile even more mobile, I’ll leave that to the geniuses), but they have faults of their own. No matter how sophisticated touch-typing technology gets, I am convinced that there is a limit to the number of characters one can type in a text message or email before calling it quits out of exasperation. It’s annoying, and there’s no two ways about it. So Laurel, you say, welcome to the age of the iPad – the best of both worlds. Its convenient size offers the mobility of a cell phone, and its manageable interface is conducive to easy typing. Voila. I agree, the iPad has filled a much-desired niche (although I still always laugh when I see someone listening to music from a device ten times bigger than my iPod). But I’m wholly unconvinced that an iPad enables the same effortless ability to type that a laptop affords. I’ve seen it in action and I can see how itcould be useful for short note-taking sessions. But in much the same way that punching letters on a smart phone with no more than two fingers at a time can get mind-numblingly frustrating, I believe the same goes for the iPad. Leaving out 8 perfectly capable fingers seems…silly. I’m sure there are those of you who disagree, for whom typing with two fingers on a touch interface is not all that far off from how you type on a keyboard. But if given the choice to use a physical keyboard or the touch type of an iPad, I think 95% of you would choose the keyboard. So in the age of technology solutions, what’s the solution? MAGIC. No, but really. The Magic Cube, a keyboard projection device from Celluon, can be used on literally any flat surface – your mother’s antique coffee table, that bench where the cute guy/girl is sitting, the steps leading up to the courthouse where you will inevitably sit for may hours while serving on jury duty (shoutout to the wonderful city of NYC for that gem), or the tree stump that the boy in The Giving Tree abandoned (see, still useful for something after all). 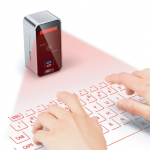 The Magic Cube projects a standard size QWERTY keyboard onto your surface of choice that connects wirelessly to your laptop, iPad, or smart phone. A bonus feature is the sound produced that corresponds to each keystroke, offering positive reinforcement that striking that precise location on your table surface or tree stump actually had some effect. Simply put, this device makes the on-the-go, must-answer-all-emails-immediately life easier. You may look a little crazy tapping away on a seemingly blank surface, but you’ll be no worse than people who walk around with Bluetooth devices in their ears. The crazy label will only last a few seconds. 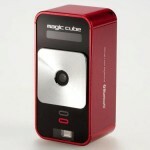 With 3.4 ounces of sleekness, the Magic Cube gives you the tools you need at your fingertips. If you like what you read, feel free to share it! ...is a design and technology enthusiast. In real life, she is a Senior Manager of Data Insights and Analytics at Tank Design in Cambridge, MA. In her spare time, Laurel likes to cook, play volleyball, bike, listen to This American Life, StartUp and How I Built This podcasts, and look for coffee shops that serve café con leche.